In an interview for "This Week," Secretary of Defense Leon Panetta told me that the Obama administration shared "nothing inappropriate" with director Kathryn Bigelow and screenwriter Mark Boal, the pair making a film about the killing of Osama bin Laden. The filmmakers have received cooperation from the Defense Department and the CIA. "Nothing inappropriate was shared with them, Jake. You know, we get inquires everyday from the entertainment industry. We get inquiries from people writing articles, from people writing books, people doing television shows," he said. "And the process that we've established is that you know, we will work with those individuals." The White House has come under fire from Homeland Security Committee Chairman Peter King. R-N.Y., who said Wednesday that the filmmakers, who worked together on "The Hurt Locker," received "extremely close, unprecedented and potentially dangerous" assistance from the Obama administration. Panetta dismissed these claims. "We'll try to make sure that we give them accurate information so that the historic record is protected. But you know, we do not share anything that is inappropriate with anybody," he said. 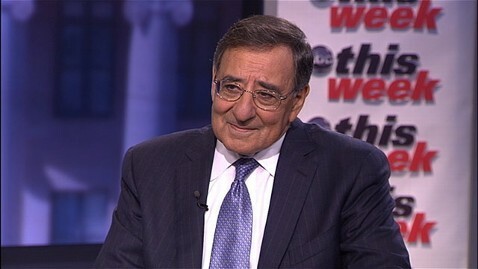 During our interview, Panetta also pushed back on the notion that there has been "chest-thumping" by the Obama campaign following the bin Laden killing and that the Obama administration's cooperation with the filmmakers bolsters that narrative. "Having participated in that operation, is that it was something very special in terms of both the intelligence and military communities working together to go after bin Laden and doing it successfully," he said. "And whether you're Republicans, whether you're Democrats, whether you're Independents, I think this country ought to be proud of what our intelligence and military community did. And you know what, I'll let history be the judge as to whether or not that was a successful mission."